SEMrush Review - Is it the best digital marketing software of 2017? 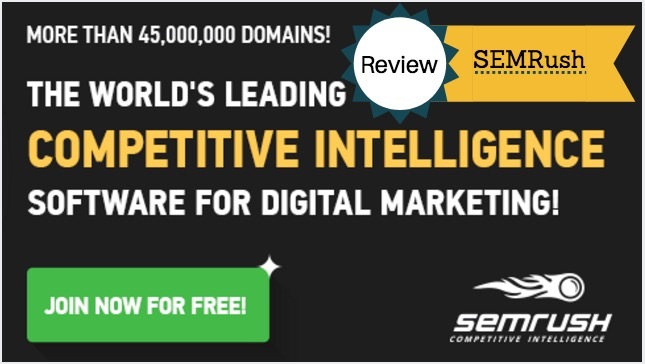 This post of SEMRush review is for all the internet marketers that want to rank their website on the top of Google ranking. And I would say that your search of an SEO tool which allows you to do in-depth keyword research along with tracking of keyword rank, checking backlinks and most importantly, to accomplish exhausting SEO audit of your blog is over now. Currently, it has been used by many trusted and professional bloggers as well as many SEO agencies. When we talk about this wonderful tool, one question will definitely pop-up in your mind. Well, to answer this question, we present you an in-depth review of SEMRUSH which will provide you necessary details to make this decision. Like most professional bloggers, if you are doing SEO and link building, which is quite a painstaking process, one needs to understand the importance of content quality to improve the SEO of a blog. With improved SEO, one can see improved analytics stats. It also comprises of extensive keyword research and requires an understanding of its importance. As many of you know that having high-quality content is not enough to survive in the blogging world. One needs to build quality links over the time as well as carry out regular SEO audits of the website. At present, there are many tools available in the market such as Moz, Ahrefs, SEMRUSH, etc. Many of you may have worked with them, but there are inherent quality features of SEMRUSH which make it a unique proposition for the bloggers looking for improved blog performance. To understand more about SEMRUSH, we will now introduce to you the brief overview of SEMRUSH. SEMRUSH is a competitor analysis tool which was founded back in 2008 by the creators of well-known browser-extension, SEOQUAKE. At this time, SEMRUSH has over 46 million domains with over 120 million keywords in its database. Unlike other keyword research tool, SEMRUSH provides a unique path to find and discover profitable keywords by following simple steps. SEMRUSH also makes it quite easy to find the ranking of your site or any other site for a particular keyword. It makes keyword research a child’s game. After completing keyword research, one can easily add keywords and position track in major search engines such as Google, Yahoo-Bing, etc. based on particular geographical location. It is quite important characteristics especially for those who wish to target particular countries like US, UK, India, etc. For bloggers, this feature is god-send as they can find their site rankings in specific countries’ search engines. SEMRUSH is an important Search Engine Marketing or SEM tool for professional bloggers and internet marketers. It allows them to find all the keywords for which any web page is ranking on the search engine. One can easily find detailed statistical data regarding specific keywords along with related keywords which one can rank for. In order to make it simple to understand, have a look at the screenshot below. By observing this, one can understand the importance of SEMRUSH for bloggers and professional digital marketers. Let us take an example to explain you few of its characteristics. We have searched for a keyword in SEMRUSH, and it displays the results from a specific domain. Just add the domain name at the top, and you will receive the below information. Mentioned below is the explanation of the major fields of this report page. Keyword – Keyword for any specific page which is ranked. Pos – Keyword’s position in any specified search engine. Here we have selected Google’s US database. Volume – Number of match queries for the mentioned keyword in the local search. This data is fetched from Google Keyword Tool and its verified by me. CPC – It represents average cost per click for that particular keyword. URL – The specified URL belonging to which the keyword is driving the traffic towards. Com – This highlights the competition of advertiser for that particular keyword. In the case of lower number, it means that there is little competition while a higher number means that there is greater competition for that particular keyword. Results – The number of search engine results. It is said that if the number is low, then it means better for the website. Trend – To find profitable keywords, this column provides the necessary details which allow the user to make sure that the traffic is trending for that particular keyword and it is not dying. This column highlights the search trend for a particular keyword over the period of last 12 months. Now, we will discuss the salient features of SEMRUSH which will provide you the necessary information regarding its capabilities and importance in keyword research. When it comes to SEMRUSH dashboard, it is quite straightforward. The very first thing one can witness is the snapshot of the Domain analytics which shows a quick breakdown of present keywords along with the traffic arriving from both organic and paid sources. There is widget for each face of most recent SEO project. Mentioned below is a test project in which we have presented with boxes for us to set up tools such as a periodic site audit, position tracking along with backlink auditing and brand monitoring. Other tools like Moz and Ahrefs can be integrated with social media sources and provide the facility to conduct brand monitoring along with mention tracking, but in the case of SEMRUSH, it is the only tool which we have tested which can also double as social media listening platform. The foremost reason for me to write SEMrush review is to provide you step by step instruction on how to use it, below you will find few working screenshots I took to display real data from SEMrush database, look closer to gain more. At the main SEMRUSH left-hand navigation bar, it has five main tabs, namely, Domain Analytics, Project, Keyword Analytics, Lead Generation Tool and My Reports. This stream of review is focused primarily on the ad-hoc keyword research as it is beneficial for the business user to find and identify the best possible search engine results page of SERP, to target by using a rank optimization strategy. While testing, we found out that the same set of five keywords with which we were focusing, we found how SEO metrics, results along with related keyword recommendations were different. The search bar on the top of the SEMRUSH interface can easily be configured for any given metric so that we can search keywords which is selected for Keyword Overview by using the drop-down menu and also ran queries on the five keywords that we used. After that, the keyword overview populated different varieties of tables along with charts and interactive data visualizations. In the case of specified keyword, SEMRUSH provided us a breakdown of paid versus organic search along with average monthly search volume as well as a cost-per-click breakdown of the amount of money a paid result would be deduced in different countries. However, SEMRUSH doesn’t allow you to filter search results according to any specific cities, but it does consist of the option to filter with respect to a country. Another unique filter which SEMRUSH offers is an option to toggle between the mobile and desktop search traffic. As mobile is taking over a growing chunk of search traffic, we used SEMRUSH to break down traffic in this way. SEMRUSH comes with enhanced traffic and SERP breakdowns and with its positions report, it populates what particular keywords that one’s competitors have lost such that one can find the opportunities of their own domain and the keywords which are new for them. It also allows to track changes with the use of Position Changes report. In order to conduct a trickier comparison, the user can use the Domain versus Domain tool which offers the user to see what keywords the competitor is ranking and what the user is not. This platform’s newly modified Position Tracking tool comes with various kinds of smart filters which allows the user to check which target keywords trigger various SERP features and which of those SERP features one has managed to earn and which of them the one’s rival occupy. This tool also identifies what web pages currently have the highest probability of ranking in SERP results, which remains to be an added bonus for the user trying to achieve hyper-local SEO targeting. One can setup multi-targeting campaigns which allow to track different locations or various devices at once, searched down by city, all within a single project. When it comes to in-built reporting, and organization functionality, SEMRUSH hits the bull’s eye with its Projects feature. By clicking on the Projects tab present on the dashboard at the left-hand nav, one can access a dashboard centralizing the entire domain data on the site along with current “health score” which is based on SEMRUSH crawling data as well as position tracking information required for ranking on different keywords and another useful feature of SEMRUSH: SEO Ideas. The major importance of any SEO tool is its ability to provide proactive suggestions as well as optimization recommendations. The SEO Ideas feature allows the user to enter all the keywords and then associate them with specific landing pages present on the website which the user want to optimize in those specified search results. SEMRUSH also provides a number of ideas broken down into various categories namely, Strategy Ideas, Semantic Ideas and Content Ideas along with Backlink Ideas and Technical SEO Ideas. Another important feature of SEMRUSH is that it easily integrates with Google Analytics as well as Google Search Console which allows the user to pull any specific landing pages from both of these sources. SEMRUSH has also provided a new tool named as Keyword Magic which can generate up to three million ideas for any keyword based off a seed keyword the user is targeting. Using this tool, the keywords are automatically segregated into different groups and subgroups. These keywords can be directly sent to the Keyword Analyzer. This tool also allows the user to filter keywords which trigger various SERP features and then find out all the keywords which contain queries, which assists to target Google’s Feature Snippets for any particular keyword. The starting price of SEMRUSH is $99.95 per month for its Pro plan. You can also pay $999.95 upfront for an annual plan which saves you $200. This Pro plan provides you with 10,000 results per report across the SEMRUSH domain as well as keyword analytics tools along with 3,000 reports or searches per day. The Pro plan allots five projects with 500 keywords to track along with a 100,000 crawled page limit as well as up to 50 associated social media profiles with 5 scheduled PDF reports. Although you will find pricing a bit high, but while doing SEMrush review, I signed up with their affiliate program that allow new users to sign up for a month absolutely free. Using the link, you can get the free month and enjoy the keyword research power at your hands. Then there is Guru plan which costs at $199.95 per month with an annual option to pay $1999.40 upfront. This saves you $400. With this plan, you get 30,000 results per report as well as 5,000 reports/search per day. This plan also provides you 20 PDF reports along with custom branding which is available as well as historical data access, 1,500 tracked keywords, 100 social media profiles an 300,000 crawled pages. With Business plan costing at $399 per month or $3999.40 per year, you get unlimited projects, white label PDF reports, access to product listing ads as well as multi-user management and access to API. SEMRUSH also provides custom solutions for different type of business according to their special marketing needs which include custom keyword database, on-site training, custom limits and other add-on features which are available on request. It is a comprehensive keyword tool and comes with domain analytics and helps in uncovering the organic rankings of your competitors. It has Backlink tracking feature as well as ability to check top performing pages according to best content ideas. It provides Desktop/mobile search breakdowns. It can quickly identify different keywords with their highest traffic potential. Its unique Project-based SEO campaign structure is seamless and easy to use. It provides keyword suggestion as well as proactive SEO recommendations. It also helps in finding numerous competitors by using a single seed URL. It lacks the ability of keyword list management, and its keyword difficulty metric is quite unreliable. Its Backlink analysis reports can show very inaccurate data. Its traditional keyword research functionality is quite weak. It is unable to perform any manual SERP analysis within the tool itself. Its user interface is quite complex and can be daunting for new users. We hope that this SEMRUSH review has been a useful to you to understand the impressive features of this awesome search engine marketing tool along with knowing its benefits. It is useful tool for research and analysis. Do share your views in the comment section below.